Steven (Chicagoland, United States) on 12 February 2015 in Cityscape & Urban and Portfolio. Kapoor's design was inspired by liquid mercury and the sculpture's surface reflects and distorts the city's skyline. 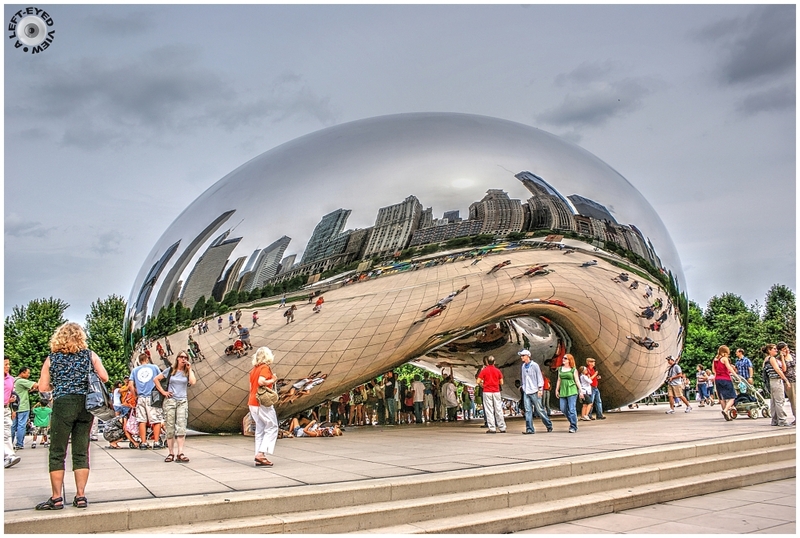 Visitors are able to walk around and under Cloud Gate's 12-foot high arch. On the underside is the "omphalos" (Greek for "navel"), a concave chamber that warps and multiplies reflections. The sculpture builds upon many of Kapoor's artistic themes, and it is popular with tourists as a photo-taking opportunity for its unique reflective properties. The sculpture was the result of a design competition. After Kapoor's design was chosen, numerous technological concerns regarding the design's construction and assembly arose, in addition to concerns regarding the sculpture's upkeep and maintenance. Various experts were consulted, some of whom believed the design could not be implemented. Eventually, a feasible method was found, but the sculpture's construction fell behind schedule. It was unveiled in an incomplete form during the Millennium Park grand opening celebration in 2004, before being concealed again while it was completed. Cloud Gate was formally dedicated on May 15, 2006, and has since gained considerable popularity, both domestically and internationally. Excellente capture, colour and details ! Spectacular sculpture! Sunning reflexions and interesting note! Magnifique ! Je le préfère ainsi, en couleurs. I've never seen a bad photograph of this . . comes up fresh every time. Fantastic image - like a portal to another world! That is so cool. I would want to shoot there all day. Wonderful composition ! Superb ! Your view makes good use of the reflective qualities of this sculpture. It was inside a scaffold in 2005. Now it looks great. Wonderful colors, reflections, and details in this image. An incredible piece of art. I really enjoy your wonderful images of this enchanting sculpture. The only thing better then the photo is the detailed explanation. Wondering who keeps it clean and shiny. Gorgeous reflections! I have always wanted to see this! Such a beautiful sculpture. Wonderful information! A few steps and you have a completely different view of this wonderful art. That would be so much fun to photograph. Amazing! I'd love to be there and take photos! A fantastic image with beautiful reflections and color combinations .Beautifully captured ! Great, love this fascinating place! I really like this perspective. Superbe photo qui mérite le spotlight, mais ça c'est mon avis. Artists are amazing... getting this design from liquid mercury ... now that is inspiring! You've really captured it at the right angle too... this is something I would like to see. Awesome! I love your photos of this 'bean' ... and every one is so different. How they polished it to hide the seams is beyond me. Wonderful mirror to light and colour that it is, you could shoot this every day of the year and all will be different.